Early this afternoon I heard a voice at my front door. 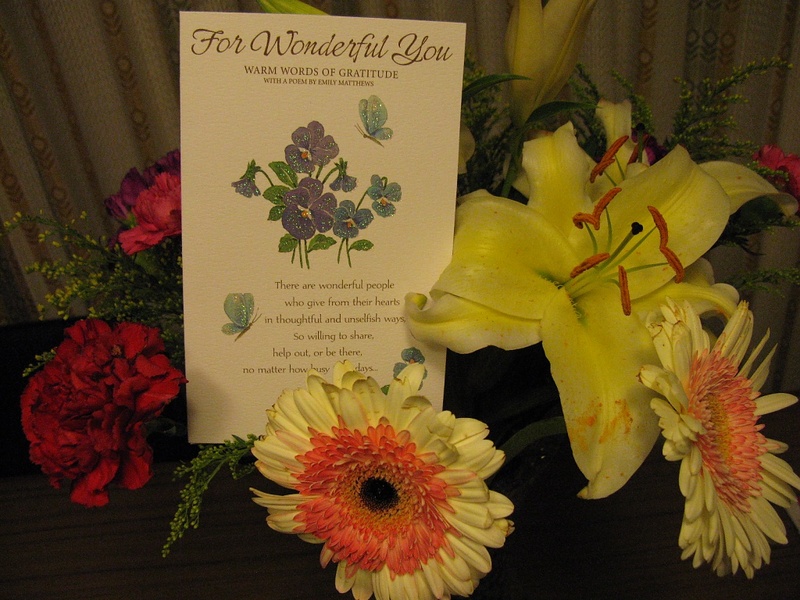 Imagine my surprise to see my oldest brother bearing a beautiful bunch of flowers and a card. You see about 3 1/2 weeks ago, my brother, Allan asked me to organise airfares to Munich (Germany) to attend a mate's wedding on 8th May. He hadn't got around to organising it or his passport !! I suggested that as he was spending that much on airfares, he might like to visit an old mate in Scotland , and then do a tour of Europe. In spite of him not being sure of dates & times, I finaly organised a great package for him for a month. I know he will have the best time! He leaves on Wednesday - this lovely brother of mine. with their gentle and beautiful light. more that words can say. That's so sweet, and the flowers are beautiful. That's such a nice gesture...on both of your parts! We've found that Australians take longer travel trips and anyone we know. We've decided it must be because you have so far to go to see anything! Won't he have a lovely time! this is very touching! you deserve every bit of the words said in the card! I agree it was just lovely and so unexpected.